If I’m bringing a fruit salad, I still have my pride to look after, and can’t bring just your average fruit salad. There are, however, limited ways that you can dress up a fruit salad! Sure you can add some exciting tropical fruit, but it’s still a bunch of fruit mixed in a tupperware. 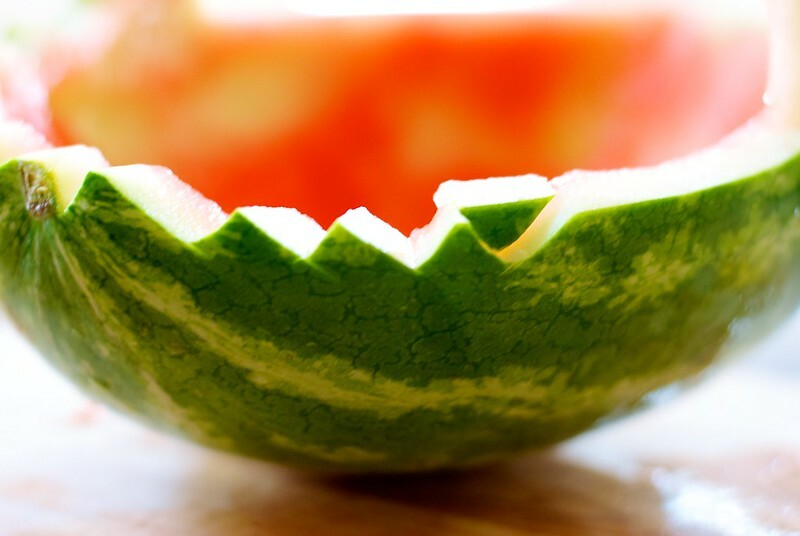 So about 10 years ago, while I was in high school, I came up with the idea of making a bowl out of a watermelon. While I’m sure countless people had come up with the idea before, it was novel to me, being before the time where I started looking up absolutely everything up on the internet. 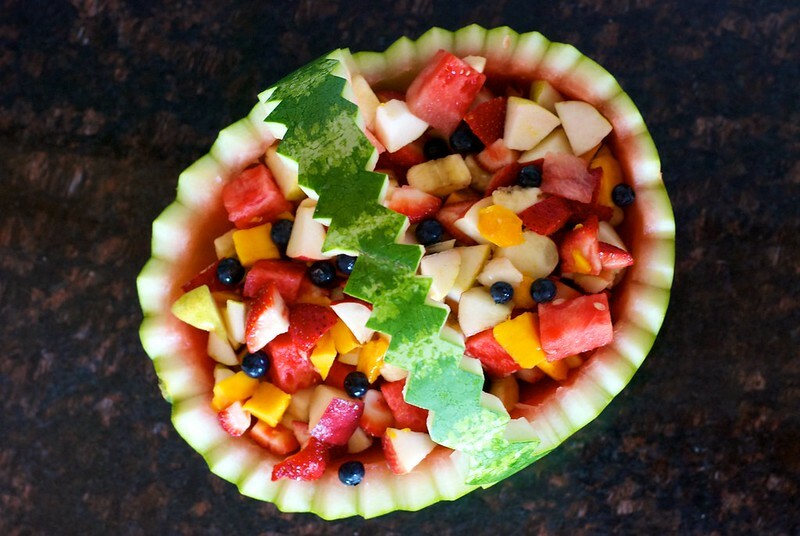 It’s extremely easy to make a watermelon bowl and sure does a lot to make fruit salad more exciting. I’ve included some easy step-by-step picture instructions. Feel free to experiment and change up the cut or design of the bowl and make it your own! Next using a smaller knife cut out the flesh underneath what will become the handle of the bowl. Do not pick the bowl up by this handle! It’s for decoration purposes only. Using a large spoon scoop out the flesh from what will become the bowl that will hold your fruit salad. Make sure to save this to use either in the fruit salad or eat on it’s own. There! You have your finished bowl! Now fill it with whatever fruit salad you would like (mine here included: watermelon, mangoes, strawberries, blueberries, pear, and banana)! Voila! a beautiful and unique serving dish for your fruit salad. I recommend transporting the actual fruit salad in a tupperware and then putting it in the bowl upon arriving to your picnic. Or if you don’t have much else to carry, wrap it up carefully with plastic wrap and place it at the bottom of a large paper or reusable bag for easy transport. This entry was posted in brunch, dessert, salad and tagged fruit, fruit salad, watermelon. Bookmark the permalink. Wow, beautiful! How long does it take you to create this masterpiece? Amazing! 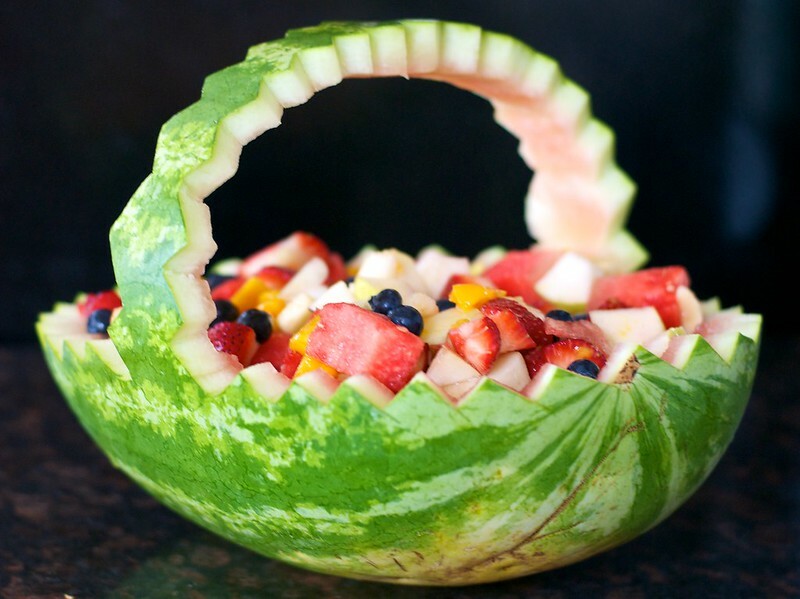 What a great idea for serving a fruit salad at a bbq. How easily would that transport to a picnic? It looks a bit precarious, and I worry the handle would break. But I’d love to make it for a party I’m hosting at home, or very nearby! Well, like I said it should hold up just fine as long as you don’t carry it by the handle. You can put it in a bag (such as a reusable grocery or canvas bag) and carry it in the bag. And you can either keep the actual fruit salad in a separate tupperware if you’re concerned about it or wrap up the bowl in plastic wrap so nothing falls out! Impressive, I love a bit of showing off! Good to know all your digits survived! Wait…they did, didn’t they? You make an amazing fruit salad! It sure does add character and isn’t even as difficult as you might think. Thanks for sharing and congrat’s on being FP’d! That looks great! I love watermelons so I will definitely try this! Very cool! Our winter here in the south has not even begun and already I’m craving summer and all the lovely summer fruits! That is awesome. 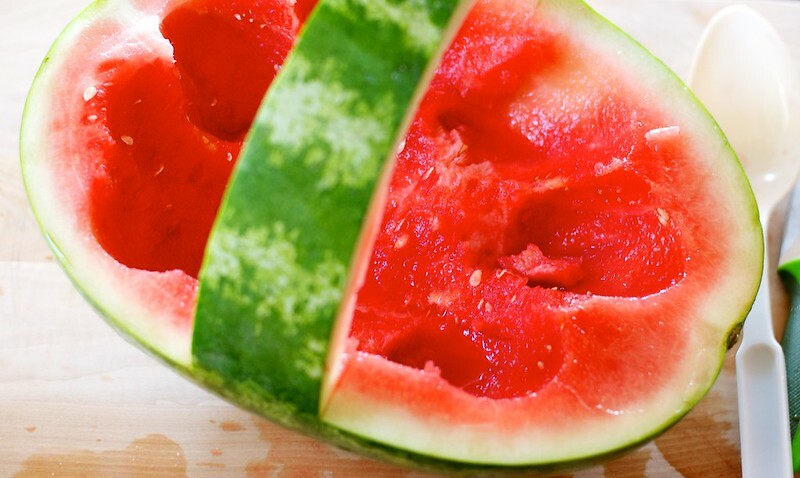 I love watermelon. My favorite in the summer and your idea is beautiful. TY for posting it. Very interesting! I have found articles of a different shaped watermelon if your ever interested in growing them. Japan grows them in sqaure containers to make them fit in refridgerators easily. I just think they look super different and I bet there are a lot of ways you could decorate these too. If your interested just google square watermelons. Thanks for sharing, I always wondered how these were done! This is fantastic! Not only is it aesthetically pleasing, it is also budget-friendly! I would love to make this one too. Thanks for sharing! If you have time, please like: https://www.facebook.com/pages/Recipes-for-Food/148457685283878. Thanks! I’ve also seen a baby carriage made out of the watermelon with orange halves as wheels. FYI in case you are going to a baby shower! 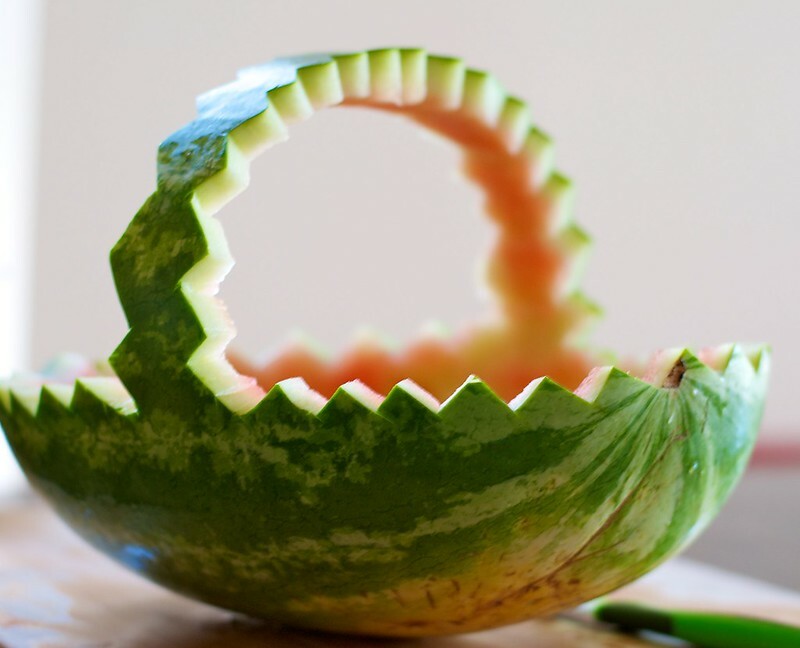 So cool…now I cannot wait to buy a watermelon this weekend and try this out. Thanks for sharing! Very pretty!! I can’t believe it only takes you 15-20 minutes. It’s really nice. Besides being adorable, it’s so handy for summer BBQs! I saw watermelons in the market today . I think I’m gonna do this this weekend. Looks so yummy, and so easy to prepare. I love this, such an awesome idea! I will definitely have to try this next time I do a fruit salad for an event! This is amazing! Great idea when you need to cater for a lot of guests. Looks so pretty. Who ever said you shouldn’t play with your food!? Beautiful and functional – I can’t wait to try this at one of my summer BBQs! This is a great photo, how-to. Thanks for sharing. What a great idea. Unfortunately summer is finished here, and we went see watermelons for another 8 odd months. /jealous! Creative yet needs carving skill. I’ve always wondered I can do the same with a coconut shell LOL. What a creative tip! I am throwing a baby shower in a few weeks and want to have fresh fruit as a dish. I’ll definitely try to do this. It will definitely jazz up the look. Its simply beautiful and very creative. This looks amazing. I am definitely going to try this at next family get together. So cool! 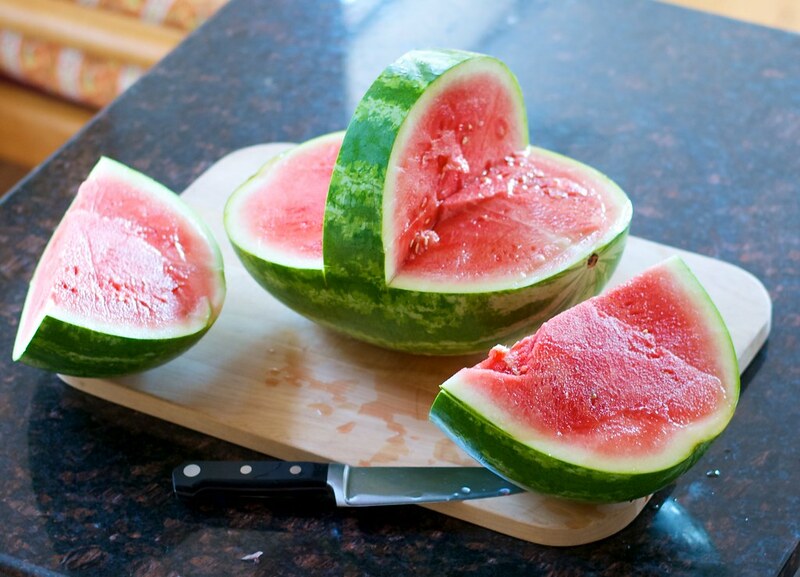 I love watermelon!! Actually, you made me crave it and I’m going to eat it right now! 🙂 Congratulations for being on the Freshly Pressed! 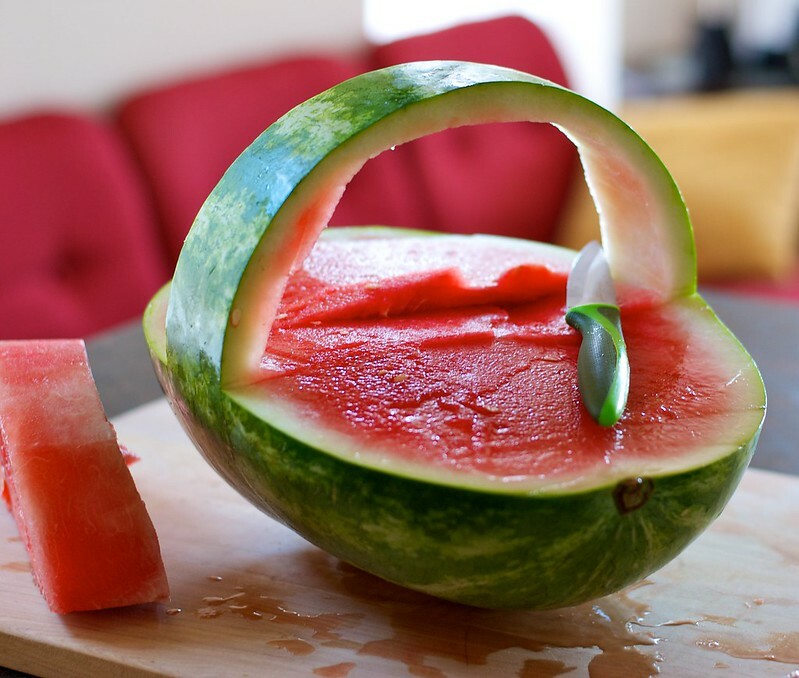 a delicious water melon basket! what a delightful idea for some refreshing breezy summer house parties. best of all, no need to clean up afterwards. definitely a tick in my books. You’re like Martha Stewart. Now lets add some rum or vodka! Amazing I must try this one great idea! This is simply awesome and helpful. Now I can make the same by myself…have been thinking about for a long time. so delicious! I am hungry! I love this inventive idea. It looks amazing and I am definitely going to try making one this summer. I tweeted it on my tweeter page as well. Brilliant. This is so adorable!!!! Think I’ll make a WATERMELON SERVING BOWL for my book club that I’m hosting this Sunday ! Thank you for the inspiration! wow! delivering happiness! so sweet, i like it! Seriously? That’s awesome! I’ve always seen these but never considered making one myself. I’m so inspired! You made it look really easy. I’ll definitely be making one of these at my next summer soiree! Thank you! Now that’s summer fun if I’ve ever seen it! The whole family will be impressed with my new skills. 😉 Thanks for sharing. So sweet! Now I know what to serve for dessert on my birthday dinner next Sunday! Thanks for shareing, you are an inspiration! How cool! I’ve always wanted to try one of these but I’m not very good with a knife. 🙂 I’d love to have you stop by my page. I’m a professional tarot reader. This is awesome! A good choice for the next round of family barbecues this summer. this is so creative, nice work! That is amazing. I’m having a party this weekend and I will have to try that! Very cool! Great pictures! And congratulations on being freshly pressed! I totally have to try this! Awesome! I wouldn’t have tried it before but you showed how easy it is. A good idea for a summer picnic… or even a late-spring picnic! Very beautifully done, simple yet great…I’ll try for sure. Thank you! This is great and looks like something I can do! Tis the season for this and perfect for me since fruit is naturally gluten-free! Thanks for this post! what a perfect serving bowl for the fruit salad! So original and pretty, and watermelon is one of my absolute favourite summer fruits! I’m going to make this tomorrow! Happy birthday!!!! Serving Bowl � Strawberry Pepper” shows that you actually fully understand everything that u are speaking about! How far in advance do you think I could make the basket – without the fruit salad in it? I need to make several for a large party. That´s a crazy thing. Had a Watermelon as a Serving Bowl before, but without the handle. Nice idea, thanks!